If you had Googled me before I started this blog, the only results would have been from Boy’s Life‘s archives and a site called “Ask Dr. Math”. Boy’s Life published a joke I sent in when I was 10 (they paid me two dollars for it! ), and Dr. Math helped me win the 9th grade science fair by suggesting a way to measure the randomness of a shuffled deck of cards (they gave me a reference book for it!). Nerdy websites and jokes. That’s pretty much me in a nutshell. There also appears to be some rage in this nutshell. I love science. I like my knowledge like I like my men: systematic and rejected by religious fundamentalists. I love it so much that I’ve made up my own branch of fake science. I call it Science With An Exclamation Point!, and it has no basis in real science at all. 5) Conduct an experiment and collect data. Tesla’s Mustache: Another scientific victory. 1) Get kind of bored or make an observation. 3) Do some brief Googling! 4) Envision an experiment and decide it must be conducted IMMEDIATELY! 6) Conduct an experiment and collect completely subjective data! Don’t record it! Don’t analyze it! 7) Jump to a conclusion because jumping is fun! 8) Don’t re-test anything! You clearly have an accurate picture of all the possible outcomes of your shaky experiment and perfunctory research! This kind of wild experimenting has led to some interesting life choices that I have a hard time explaining to responsible adults later. 1) Did everything Cosmo said for a week… er, three days. 2) Updated Facebook with just the word “poop” after a friend bet me no one would comment on it. Conclusion: It may depend on the punctuation you use after the word. People responded positively to “Poop!”, which is the only one I tried before I forgot the experiment. 3) Ate french fries with mustard because I had no ketchup and secretly hate fries. Conclusion: I’m never going back. Mustard may not be socially acceptable on fries yet, but eventually you’ll all come around. 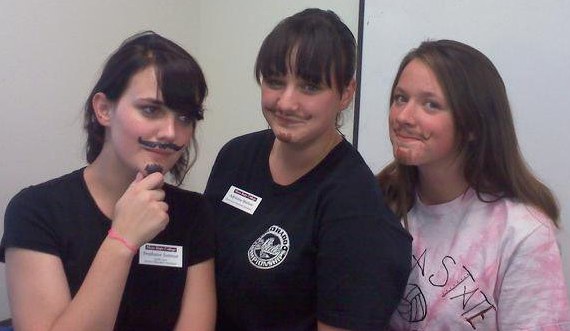 4) Let someone draw a Magic Marker mustache on my face, gave my friend Adrienne one, and went to Walmart, partly because we were too tired to remove them and partly because I wanted to see what people would do. Conclusion: Mustaches make you incredibly popular. Also, my picture may end up on People of Walmart. 5) Led several people to believe that my coworker is my recently-discovered fraternal twin sister, because we look a little alike. Conclusion: People , including your own family members, only look at your shape, your hair, and your glasses when they see you. Also, our picture may end up on some freaky twin-themed website. 6) Sat mostly naked in an egg that told me my BMI in my school’s Human Performance Lab. I also strapped on some headgear and a snorkel and ran on a treadmill until I wanted to die/ran out of drool. Conclusion: I’m 23% body fat, and I need to exercise more and wear headgear less. Science will change your life. Stay in school, kids, but don’t let your education get in the way of your learning. Here is an awesome song about Nikola Tesla. You’re quite welcome. haha! i like this! oh the mustache…..
You should take your “science! show” on the road, teaching kids that “science!” can be so much fun. Ha! I love your methodology, especially, “9) Eat something!” I also love your mustaches. Your! Method! Is! Clearly! Superior!! !